This book presents teachings given by Lama Zopa Rinpoche during the 42nd Kopan lamrim course in 2009. In these teachings Rinpoche discusses our potential to bring benefit and happiness, including full enlightenment, to all sentient beings. Rinpoche explains the stages of the path to enlightenment, teaches extensively on emptiness and the good heart, and gives commentaries on sur practice, the Offering Cloud Mantra and other prayers and practices. 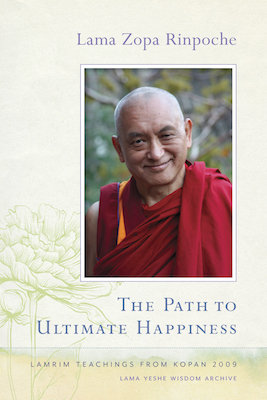 The Path to Ultimate Happiness conveys the spontaneous and intimate quality of Rinpoche's teaching style and includes many anecdotes from his own experiences. Rinpoche encourages us to study and practice Dharma in order to purify the mind, collect extensive merit and achieve realizations. In this way, our life becomes most beneficial and useful to others. Order the ebook from your favorite vendor using the links below. You can also read excerpts from this book online. LYWA Members can download the ebook for free from the Members Area.